➤ Upon arrival you will be welcomed by our guide and transfer you to the hotel. ➤ Overnight stay at the hotel. ➤ After breakfast transfer airport in time to take flight for Bagdogra in SIKKIM. ➤ Sikkim, said to be The Most Exotic Place in India is bordered by Bhutan, Tibet and Nepal. Being part of the Himalayas, the area has a dramatic landscape that includes India’s highest mountain, 8,586m Kangchenjunga. 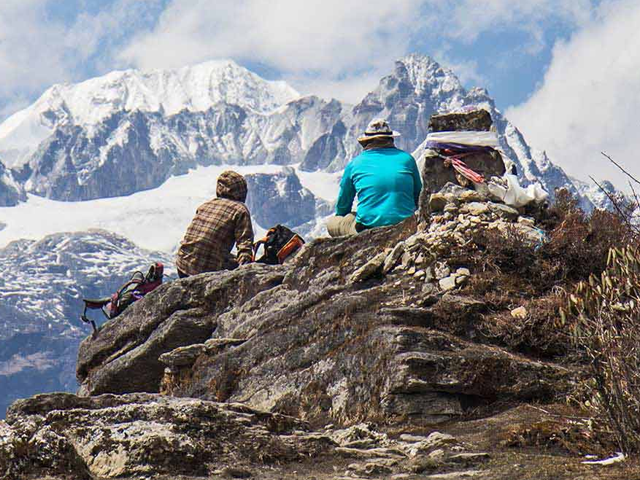 Sikkim is also home to glaciers, alpine meadows and thousands of varieties of wildflowers. Steep paths lead to hilltop Buddhist monasteries such as Pemayangtse, which dates to the early 1700s. ➤ Dinner & Overnight in Darjeeling Hotel. ➤ Early morning, approx. at 4.00 AM, you will visit Tiger Hill before the break of dawn to see the Sun Rise over Mount Everest, the Highest Mountain Peak in the World (subject to clear weather). ➤ On your way back stop at the Ghoom Monastery, the Holiest Monastery in Darjeeling and Batasia Loop. Return to hotel for breakfast. ➤ After breakfast, proceed on a Discovery Tour of Darjeeling. Visit the Japanese Temple, Peace pagoda, Himalayan Mountaineering Institute & Padmaja Naidu Himalayan Zooogical Park. ➤ Take the Toy Train of Darjeeling to reach Ghoom. This ride has always remained as a unique experience to the tourists. This Toy Train has been accorded the UNESCO World Heritage status and said to be the Highest Toy Train Ride in the world. ➤ Proceed on to Pelling (75kms/approx 5hrs.) On arrival check-in at hotel. ➤ Dinner & overnight at hotel in Pelling. ➤ After breakfast, proceed on to visit Pemayangtse Monestary, One of the oldest Monasteries in Sikkim, Pemayangtse monastery is the perfect site to meet the soul inside. The literal meaning of “Pemayangtse” is the perfect sublime lotus and is considered as an altar for the entire Buddhism clan. The monetary was founded in the 17th century and sits atop a hill at a height of 2085 meters with snow clad mountains guarding it on both sides. ➤ Thereafter proceed to the Rabdestse Ruins in Pelling. This was the former capital of Sikkim and now lies in ruins. It was destroyed after the Nepalese invasion in the 18th century. Located close to the Pemayangtse Monastery, the ruins offer Superb views of the Kanchenjunga Range. ➤ Rabdentse was recently restored by the Archaeological survey of India. There are great places to see in Rabdentse like a king's bed room, assembly hall, kitchen, public courtyard, palace guards' room, etc. Tourist can indulge in Bird Watching as well. One can see large species of birds around the dense jungles of Rabdentse. ➤ Proceed to Gangtok (98kms/Approx 5hrs). ➤ Upon arrival check in at hotel. ➤ Dinner & overnight stay at hotel in Gangtok. ➤ After breakfast, proceed on a Discovery Tour of Gangtok. Gangtok, the capital of Sikkim, is spreads over a forested mountain that faces the Kanchenjunga snow peaks. There are many vantage points in and around Gangtok from where you get magnificent views of Kanchenjunga and other Himalayan snow peaks. In fact every spur extending from this hill town offers a setting of a great sight. The name Gangtok means ‘lofty hill’. It rose to prominence after the construction of Enchey Monastery in the year 1840, as it then became a popular pilgrimage for followers of Buddhism. ➤ First visit the Directorate of Handicrats and Handlooms, famous for the sale of various local handicrafts. There is also a museum, to showcase many artworks and items which are created in this center by local artists and artisans. ➤ Next visit the epicDo-Drul Chorten. This is a stupa built by the Tibetan. Inside this stupa, a complete set of Dorjee Phurba, Kangyur relics (Holy Books) and other religious objects are found. Around the stupa are 108 Mani Lhakor or prayer wheels. The stupa is surrounded by Chorten Lakahang and Guru Lakhang, where two statues of Guru Rinpoche are present. ➤ It is believed that this entire place was once haunted by evil spirits and many people who wandered around this place became victims. Later a very respected and celebrated lama of Tibet Trulshig Rinpoche who followed Nyingma Order of Buddhism came to this place for hermitage. He built this stupa to drive away the spirits. ➤ Thereafter visit the Enchey Monastery, situated on a beautiful hilltop. The location was blessed by Lama Drupthob Karpo, a renowned exponent of tantric (adept) art in Buddhism with flying powers. ➤ After lunch visit the Research Institute of Tibetology Perched on the top of a beautiful hill. You can enjoy the views from the top of the hill as well as learn a lot about the norms and traditions of Mahayana Buddhism and Tibetans. The institute also plays host to one of the world’s largest collection of Buddhist books, rare manuscripts and Tibetan cloth paintings called thangkas. ➤ Dinner & overnight at hotel in Gangtok. ➤ After breakfast drive to Kalimpong 83kms/Approx 3hrs). On arrival check-in at hotel. ➤ Afternoon proceed on a city tour of Kalimpong. Kalimpong is a hill station buzzing with colorful people with lovely orchids, Gladiolus, rarest cacti and nurseries and offers spectacular views of the Mount Kanchendzonga and its range. Kalimpong is known for its greenery and has an ideal climate for walks. ➤ Visit the Flower Nurseries and the Durpin Monastery The monastery is located on a hilltop, giving you undisturbed panorama of the hilly landscapes of Darjeeling. The monastery, graced with an eye-catching facade is in itself a beautiful sight to capture. Devotees as well as tourists flock in great numbers during Tibetan festivals that are hosted in the monastery. ➤ Thereafter visit the Gaden Tharpa Choling Monastery and Thongsa Gompa the oldest monastery situated in the region of Kalimpong. ➤ Dinner & overnight at hotel in Kalimpong. ➤ After breakfast free to explore the surroundings. ➤ Proceed on to Bagdogra (80kms/Approx 3hrs) to catch flight to Kolkata. ➤ Upon arrival you may choose to extend your stay in Kolkatta or catch your onward international flight. ➤ Kolkatta City Tour: Visit Dalhousie Square (Raj Bhavan), St. John's Church, GPO, Writers Building, St Andrews Kirk and other British Buildings, Indian Museum, St. Paul Cathedral Church, Victoria Memorial. Drive Past: Maidan & Fort William and Mother Teresa House.